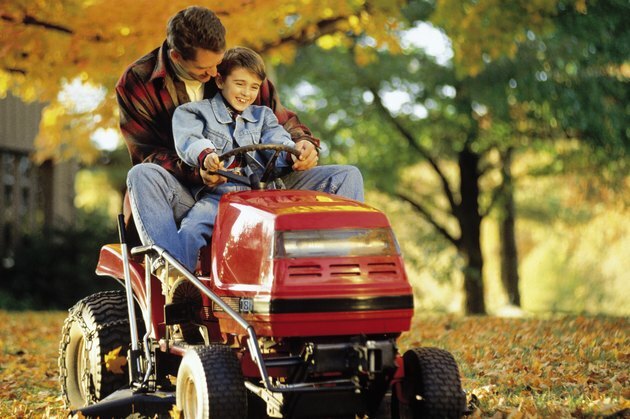 When you are planning on overhauling or rebuilding your MTD lawn tractor, you should strip off any extra weight or main components of the lawn tractor first. This includes removing the mower deck. The mower deck is securely attached to the base of the MTD lawn tractor frame. Removing it takes a few supplies, but is well worth it; it makes working on your mower much easier since the deck is a heavy, large component of the lawn tractor. Slide some even sized wood blocks under every corner of your MTD lawn tractor deck. Set the mower deck lever to the lowest setting; this will remove the tension in the springs holding the deck up. Grab the belt in the blade pulleys on the top of the mower deck. Slide the belt off of the pulleys. Pull the tension springs holding the deck to the base of the mower frame out of the holes they are hooked in. Use your pliers out pull them out if you can't by hand. There is a tension spring on all four corners of the mower deck. Set the mower deck lever to the highest setting. Pull the wood block out form under the deck. Push the deck out form under the MTD lawn tractor frame. How do I Remove the 38-Inch Mower Deck on a John Deere LT155 Riding Mower?